The 2019 NFL Draft is little more than three weeks away for the New Orleans Saints and the rest of the League. It officially gets underway on the night of Thursday, April 25th, and will last until Saturday afternoon, April 27th, at the Cumberland Park area near Nissan Stadium in downtown Nashville, Tennessee. Despite nearly making the Super Bowl last season and having already addressed a few holes on their roster that needed to be filled this off-season through NFL Free Agency, New Orleans still has a few more weaknesses that could greatly benefit from being addressed; specifically at wide receiver, edge pass rusher/defensive end, an offensive lineman that can play both the guard and tackle positions, and perhaps even at safety for depth purposes. Unfortunately, due to the many trades that they made last year to acquire rookie defensive end Marcus Davenport (1st Round pick), along with young veterans Teddy Bridgewater (QB, 3rd Round pick) and Eli Apple (CB, 4th Round pick), the Black and Gold will only have a 2nd Round pick and a 5th Round selection to go along with two 6th Round picks and two 7th Round picks. That gives them a grand total of only six picks in this year’s draft — which is actually the 2nd-fewest League-wide. Of course, it won’t come as a shock if Saints team brass (general manager Mickey Loomis and head coach Sean Payton) decide to “wheel and deal” to acquire some additional picks. But if they actually make the choice to go that route once again, chances are they’ll do so by choosing an available player(s) who can help the team not only for the upcoming 2019 season but for well into the future. However, you might want to keep this much in mind: at every position, this year’s 2019 NFL Draft Class is thought to be by some observers one of the event’s deepest in recent years. In case you missed our initial Big Easy Magazine Saints Mock Draft, we went with University of South Carolina WR/kick returner Tyshun “Deebo” Samuel as the first selection for New Orleans at that time. While there’s a better-than-average chance that Samuel will, in fact, be there at #62, there’s just as great a chance that he won’t be. Given the fact that Saints head coach Sean Payton told reporters last week that the team had been interested in signing former Tampa Bay Buccaneers WR Adam Humphries (who eventually signed with the Tennessee Titans) in Free Agency last month, it’s evident that the organization still is targeting the wide receiver position in the hopes of improving it further. In the time since we published that first Saints Mock Draft, Hardman has rocketed up the Draft Boards of many teams following his phenomenal individual performance at the 2019 NFL Scouting Combine in Indianapolis. Hardman ended up running a blistering 4.33 40-yard dash, which was tied for the third-best among all wide receivers behind Andy Isabella of UMass, and Parris Campbell of Ohio State (who tied for the best time with a 4.31 and both of whom will also likely be gone when the Saints finally get to pick). Once you factor in his kick return skills and his still-blossoming wide receiver skills, Hardman appears to have now solidified his draft status as a 2nd Round pick (up from a 3rd Round projection just before the Combine) and some are now even calling him one of the biggest potential “steals” at the WR position in this year’s draft class. The Saints coaching staff is usually enamored with players that display the versatility that Hardman has, and this young man could fill a wide variety of roles as a rookie. First and foremost, he could take over the slot WR role for the Black and Gold should veteran Cam Meredith’s recovery from surgery not pan out as they had hoped (as some believe to be the case). 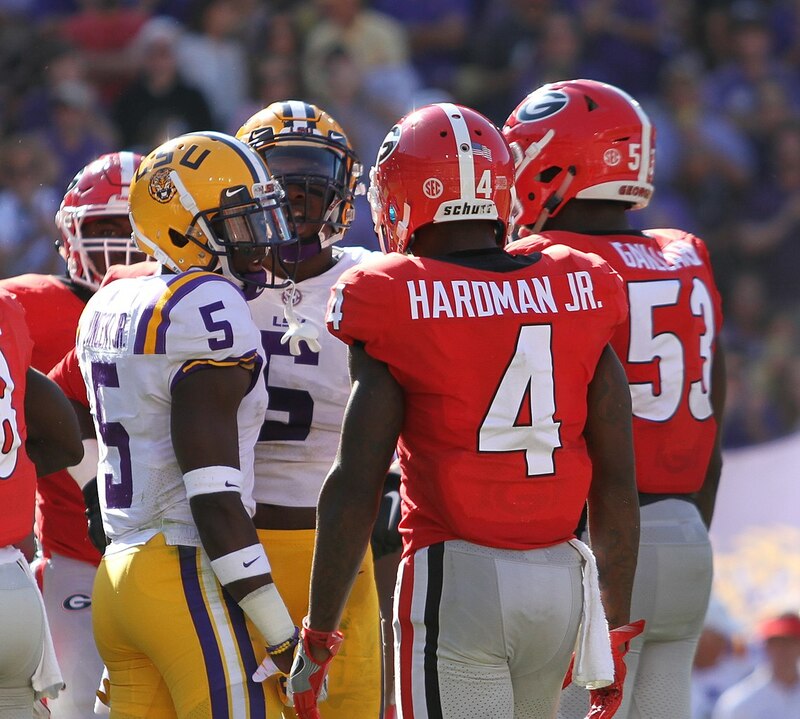 Additionally, Hardman could be used as the primary kick returner, a special teams “gunner,” a “gadget” player on offense for the use of trick plays that Payton clearly has an affinity for (jet sweeps, reverses, end-arounds, etc), and with his blazing speed, he could also be the much-needed deep threat they’ve been missing in the passing game to take pressure off of superstar #1 WR Michael Thomas. The Draft Network analyst Brad Kelly says that despite his less-than-impressive total in receptions and receiving yardage over the course of his three-year college career in Athens (60 catches for 961 yards), Hardman is a player with elite acceleration (he scored 13 TD’s on just 73 touches over the past 2 seasons) to get around the edge; and his flexibility, burst and balance make him very difficult to tackle, especially for defenders who don’t possess his quickness. Kelly adds that Hardman’s versatility and play-making abilities are “next level” — and with his vertical route running and top-notch speed, he believes that the 21-year old will be an exciting weapon in the slot for whichever team drafts him, projecting as a dynamic complimentary piece for a potentially elite offense. Hardman could save New Orleans from essentially being forced to preserve roster spots for a handful of other players, because of all the different roles that he can play. Iif that’s not compelling enough of a reason for Saints brass to pull the trigger and take him, then perhaps the fact that Hardman’s been compared to Chiefs WR Tyreek Hill or Eagles WR Desean Jackson following his impressive Combine performance might just influence their decision. Yes, Hardman is still an extremely raw player who clearly needs more refinement in some areas, but if New Orleans misses out on a player like Deebo Samuel (the Dallas Cowboys are said to very interested in Samuel also and have already brought him in for a visit to their training facility), then Hardman could get selected because of his very similar skill-set as well becoming the next shiny new “toy” for Sean Payton to play with, in the Saints offense. With starting Saints 3-tech/interior pass rush defensive tackle Sheldon Rankins likely out until October as he fully recovers from surgery for a torn Achilles, and his backup David Onyemata likely to be suspended for the first four games because of an arrest for marijuana possession back in January, the team is thought to be looking to add additional depth at that position until their return. Also, even though the Saints coaching staff likely will have recent free agent signee and veteran D-Lineman Mario Edwards Jr. filling that role initially, they also could add another one in the Draft such as Saunders — who some refer to as the “small school” version of Los Angeles Rams All-Pro defensive tackle Aaron Donald. As of this writing, Saunders has anywhere from a 3rd Round grade to a 5th Round grade (depending on whose opinion you value most), but due to his “small school”/FCS-level pedigree, could very easily could find himself falling down a bit into this part of the Draft (Day 3) and still remain available, as often is the case for an underrated or undervalued player. What’s ironic about that, is that there’s absolutely nothing that anyone could realistically undervalue about a man who, at well over 300 pounds, can run like a gazelle and do back-flips like a limber high school gymnast. At 6-foot-1 and 320 pounds, Saunders nevertheless moves with the grace of a much smaller man. In his three seasons as a starter for the Leathernecks program, the St. Louis native recorded 127 total tackles (34.5 for a loss), tallied 18 sacks, and forced 6 fumbles. He had 25 tackles for loss and 14 sacks the past two seasons alone, and as a result was named 1st-Team All-Missouri Valley Football Conference in 2017 and 2018. Last season as a senior, Saunders recorded 12 sacks with 99 total tackles (with 60 of them solo). As noted by CBSSports,com Draft Analyst Chris Trapasso: Saunders has the body of a nose tackle but obviously still has incredibly rare athleticism for his size (and moves around more like a linebacker than an interior lineman). Trapasso adds that Saunders’ low center of gravity provides him serious power which allows him to routinely win one-on-one match-ups against opposing O-Linemen, and his above-average hand-technique makes him even more effective as a pure rusher. Trapasso envisions Saunders becoming one of the best value picks on the defensive side of the ball in this year’s class, either as a rotational player early on and an eventual starter in due time. Regardless of whenever Saunders actually gets chosen, there’s no questioning the fact that he should be able to see the field early in his NFL career, as a single gap defender who can allow his undeniable physical gifts to practically take over the line of scrimmage. Not only would he capably “fill in” for Rankins (and Onyemata), but would give New Orleans an unbelievable amount of quality depth upon their return to the active roster. The only reason why he’ll still be around at this point (if in fact he actually does at all) will be because he attended FCS/”small school” Western Illinois — and not a “big school” like West Virginia. While there isn’t any doubt that the signing of former free agent and 10th-year veteran tight end Jared Cook last week alleviated the overwhelming ‘need’ for the Saints to take a tight end at #62, it doesn’t mean is that New Orleans has completely addressed the issue. The thought that perhaps “grooming” a young one at the position behind Cook is something that the team is strongly taking into consideration. And Moreau — who is a NOLA native and attended local institution Jesuit High School — seemingly would be the perfect player to do so. Moreau is another player in this morning’s Mock Draft whose stock has risen through the roof following his impressive performance at last month’s Scouting Combine. The 6-foot-4, 253 pound Moreau, who grew up in the nearby suburb of Metairie, finished with the 5th fastest time at the 40-yard dash among all tight ends, led the shuttle drill among all of them at 4.11 seconds, and did 22 repetitions (at 225 pounds) on the bench press. Additionally, the 21-year old Moreau (who turns 22 next month) impressed observers and analysts with his performance in a series of other tight end position-related drills throughout the work-out, as he managed to turn heads while fully displaying his extremely underrated skill-set. Here’s #LSU TE Foster Moreau’s first 40 attempt…impressive 4.66 for someone of his sizes and physical abilities. Moreau made himself some money today. Look for him to climb draft boards in the coming weeks. As noted by NOLA.com college football beat writer Brody Miller: Moreau’s stats numbers-wise weren’t really all that impressive during his time in Baton Rouge, especially since LSU had one of the weakest pass protections in the country last season (they allowed 35 sacks; which was one of the worst sack rates in the entire nation). Moreau only caught 22 passes on 30 targets last year as a senior; yet still managed to end up with the highest catch rate of any receiver on the Tigers roster with at least 20 targets (272 yards and 2 TDs). Miller says additionally that when LSU was able to utilize him more, Moreau caught five passes for 73 yards and a touchdown (against Rice) and four passes for 51 yards and a touchdown (against Texas A&M). In his four-year career with the Tigers program, Moreau played in 30 games and caught a grand total of 52 catches for 629 yards and 6 TDs. But those numbers were a clear-cut reflection of the lack of opportunities that he was given. The Draft Network lead analyst Jon Ledyard says that Moreau’s athleticism and strong hands suggest that there may be more production waiting for him as a receiver in the NFL, but that he will obviously have to develop those skills if he can land with the right team that’s willing to take the time to allow him to. Moreau potentially could help the Saints offense by using his above-average capabilities as a blocker in the running game game and also on special teams, while he continues to develop as a receiver under the tutelage and guidance of Cook as well as assistant head coach/tight ends coach Dan Campbell. My latest #NFLDraft profile is up at @DraftNetworkLLC, on @NevadaFootball EDGE Malik Reed. With the departure of former veteran Alex Okafor in Free Agency to the Kansas City Chiefs, the Saints now suddenly find themselves needing to add another rotational/back-up edge pass rusher to fill that role as well as for depth purposes; and after they missed out on acquiring former Rams and Dolphins defensive end Robert Quinn last week to the Dallas Cowboys, it would seem that New Orleans might opt to go with another youngster to develop at the position along with last year’s 1st Round pick Marcus Davenport. Reed was extremely productive, and numbers-wise he ended up being one of the best pass rushers in college football throughout his career spent in Reno with the Wolfpack program. The 6-foot-2, 235-pounder and redshirt senior played primarily as a defensive end with his “hand in the dirt” during his first three seasons; although prior to last season he actually dropped some weight so that he could transition to outside linebacker in an effort to take advantage of one of his best attributes — which are his speed and acceleration. The good folks over at Pro Football Focus had the Dothan, Alabama native ranked 3rd overall among all draft-eligible edge rushers and interior D-Linemen in quarterback pressures per pass rush snap at 21 percent; and perhaps even more impressive was the fact that his overall grade of 90.3 was good for #1 overall in the entire Mountain West Conference. In his 4 year career with Nevada, Reed appeared in 42 total games and finished with 203 tackles (134 solo), 38 TFL’s (tackles for loss of yards), 22 sacks, 2 passes defensed, and an incredible 11 forced fumbles (yes, ELEVEN of them), which included one that he ran back for a TD last season. The Draft Network analyst Benjamin Solak says that Nevada utilized Reed in a wide array of different gaps or alignments that clearly demonstrated that he wasn’t ready just yet to be deployed as an every-down EDGE rusher, but rather a movable ‘chess piece’ who can rush effectively from anywhere. Solak adds that teams who typically run hybrid fronts and love to zone blitz should value Reed more highly than most, but any team with stand-up 9-Technique rushers should look to take Reed late as a special-teams maven and high-upside depth piece. For a Saints team that has a limited amount of picks this year and not much extra draft capital to spend for trading up to get a more highly-rated prospect, getting Reed at this spot (which very well could happen) certainly wouldn’t be the worst thing that could happen to them; and in fact it would fall right in line with some of the more underrrated later round picks the franchise has made previously in the Payton-Brees Era. Both the Saints scouting department and the coaching staff always have an eye out for versatile offensive linemen capable of playing multiple positions in just about every single Draft, and in spite of having one of the top-rated lines in the League last year, this year’s Draft is no exception. With the notable struggles at times last season by 4th year veteran guard Andrus Peat, along with the likelihood of back-ups Cameron Tom and Will Clapp both expected to see increased playing time at center behind newly-signed free agent starting center Nick Easton (who replaces the now-retired Max Unger); New Orleans might be wise to find another versatile player capable of playing multiple spots which would include the guard position. And although he’s projected at the moment as a Day 3 (Rounds 4 thru 7) pick, the chance that University of North Carolina-Charlotte guard/tackle Nate Davis is still on the board for the Black and Gold by this particular point might be a bit of wishful thinking (he could go much higher) but for the sake of our Mock, we’re going with it. Davis — who can play either guard, tackle, and even at the center position in case of an emergency — made a name for himself back in January at the Senior Bowl, and is trying to become only the second player EVER from the UNC-Charlotte 49er football program (they’ve only been a Division 1 school since 2015) to be taken in an NFL Draft. Davis has developed a reputation for “getting nasty down in the trenches”, and it’s his notable mobility for a man of his size (much like our previous pick in DT Khalen Saunders of Western Illinois) that he utilizes most effectively to his advantage. It’s that ability to move fluidly and with a whole lot of power behind it, that makes him more likely better suited to play guard in a basic power running scheme rather than a zone-blocking scheme; although the Saints coaching staff would undoubtedly covet him even more so for his versatility to slide over to play either one of the offensive tackle spots (or even at center God forbid) in a pinch. The Draft Network senior analyst Joe Marino says that while Davis’ movement skills and power are his two notable appealing traits, the 6-foot-3, 311 pound 2nd team All-Conference USA selection will need to develop more consistency with his footwork and learn how to “anchor” his lower-body (or his ‘base’) better in order to achieve success at the NFL level. Marino notes that Davis most likely will start off his pro career as a back-up, before eventually blooming into a starter’s role by Year 3 provided that he cleans up any lingering issues with his footwork. "I'll take that, thank you." Just like Davis with the previous pick, the Saints very well could find themselves with an opportunity to get an underrated or undervalued player in this year’s rather deep class on Day 3 in the later rounds, depending on how the Draft Board falls and how things play out with teams ahead of them in the pecking order and what their choices were based on. The Saints really don’t NEED another safety, but they certainly could use some depth at the position behind 3rd-year veteran strong safety Vonn Bell and 2nd-year free safety Marcus Williams, following the release of last year’s free agent signee and former 9-year veteran Kurt Coleman after only one season with the club. And again like Davis with the previous pick, Blair currently has anywhere from a 4th Round grade all the way down to Round #7 (where we have the Black and Gold taking him with this final pick of our Mock). Ironically, the 6-foot-3, 195 pound Blair even played a few games at Marcus Williams’ old spot on the Utah defense the season after the Saints drafted him, and since that time Blair has developed a reputation for his desire to make contact and “lay the wood” on somebody, in a similar manner that Williams did during his time with the Utes program. Originally a junior college transfer, Blair’s versatility is what makes him stand out for many evaluators, given that he can play free safety, strong safety, and even as a slot cornerback. In his two seasons in Salt Lake City, Blair played in 22 games, had 106 tackles (79 solos), made 2 interceptions, 4 PBU’s, and returned a fumble for a defensive TD. New Orleans would likely covet Blair even more so because he has the size to cover bigger tight ends as well as the speed and athleticism that’s required to cover ‘shifty’ running backs out of the backfield. However, NFL.com Draft Analyst Lance Zierlein cautions that because of his slender frame, some teams are concerned that Blair’s durability and endurance over the course of a whole NFL season could become an issue over time, given his notable aggressiveness. The free safety spot likely projects as his best position specifically, although there are more than a few scouts such as Zierlein and others who feel that Blair will be an ideal single-high safety in the modern-day NFL. However, that comes with a bit of a caveat, since his tackling ability leaves a little bit to be desired. It’s because he’s so overly aggressive, that Blair is prone to losing his sense of awareness on deep throws, by either over-running the play or taking a bad angle while trying to dish out one of his violent hits upon an unsuspecting foe, which inevitably ends up most of the times with him flailing at air and miss making the tackles. Clearly, he’ll need to work on that issue at the next level, but the talent nevertheless is undeniable. And it’s that same undeniable talent that of all of these players bring to the table in this morning’s Mock, that hopefully the Black and Gold can add to their roster when the bullets fly for real in Nashville, Tennessee in just a little more than three weeks from now. Why is everyone so enamored with all of these short WRs?????????? ?